Ferñao de Magalhães, better known as Ferdinand Magallan (c. 1480 – April 27, 1521) was a Portuguese adventurer. He was a part of the Portuguese colonial conquests in India and Malacca. 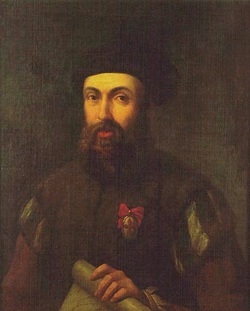 He and his partner, Rui Faleiro, were placed in charge of a fleet of five ships by King Charles I of Spain.They were tasked to find a westward route from Spain to the "Spice Islands" or Moluccas (modern Maluku Islands in Indonesia), which was the original objective of Christopher Columbus' exploration. Magellan's and Faleiro's expedition in (1519–1522 was the first expedition to sail from the Atlantic Ocean into the Pacific Ocean. Magallan named it the "peaceful sea". The passage of their fleet around the tip of South America was made through what was then named the "Strait of Magallan. Unfortunatly, Magallan didn't make it through the voyage and back to Spain. He was killed in the Phillipines.